If you have a Google Webmaster Tools account Google makes it fairly easy to remove a post, article, or what have you from the search results index. If you don’t have an account you really should get one if you have a website. 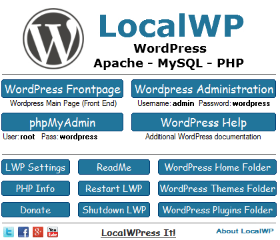 It is free, and pretty simple to add your website. Not to mention it will provide a lot of additional statistics and information about your website and links. So why would anyone want to remove a post from Google? There are a number of reasons why you might want to do so. Maybe you recently deleted an article or post from your website, and you want to make sure that it is totally removed from Google. Perhaps you have a page/content that you just don’t want to be found in a Google search. I know a lot of people would say of course I want it to be found otherwise I wouldn’t have posted it. Well believe it or not, there are quite a few reasons why someone wouldn’t want a particular post to be directly found in Google. I actually have a join page on the main part of this site that I exclude from Google. I do this because it’s a spam magnet. People search Google for specific terms surrounding this page. When they find it they sign up and instantly go to work posting link spam. So I would prefer that this page isn’t available in Google at all. “Make sure the content is no longer live on the web. Requests for the page must return an HTTP 404 (not found) or 410 status code. Block the content using a robots.txt file. If you have deleted a post from your website it would need to be returning a 404 (Page Not Found) error/status when you try to visit the page. If for some reason it doesn’t then you can block it with a robots.txt file. If your page or post exists (you are not deleting it – you just want to remove the link from Google) then you would need to add the noindex tag to the page header, or use a robots.txt to block it. When we say: “block” we mean blocking Googlebot, not blocking access to the page for everyone else. The page will still be publicly accessible. In the following example I will use a robots.txt file to block/prevent Googlebot from the page. I need to either add a line of code to robots.txt if I already have one, or I would need to create a robots.txt file and add a line of code to it. 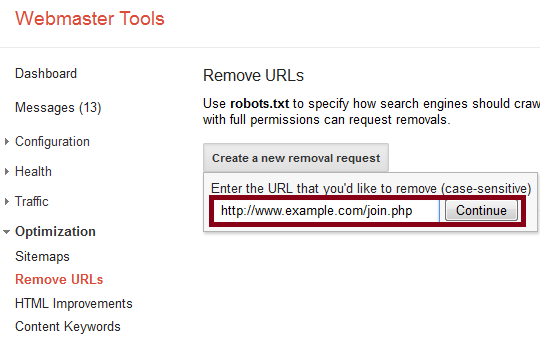 Robots.txt should exist (or be created/uploaded) in the main directory/part of your website. If your website is example.com then its location should be example.com/robots.txt. 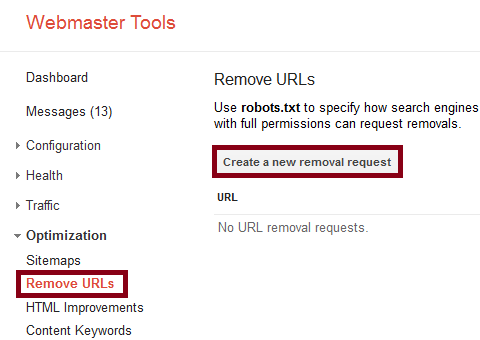 Once you have it saved you can login to Google Webmaster Tools and tell Google that we want to remove the link. Click on the “Create a new removal request” button. Enter the URL/Link in the box and click the “Continue” button. It does say case-sensitive. So if your URL/Link address contains a capital letter be sure to use one. Make your selection and click the “Submit Request” button. Once you submit the request it will appear as pending on the “Remove URLs” page. You can cancel the request if you messed up or change your mind. 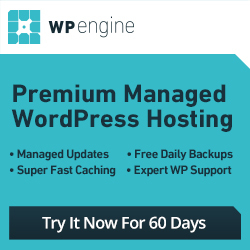 Usually URL Removal requests are processed (completely removed) within 24 hours. So if you change your mind you would want to cancel the request right away. 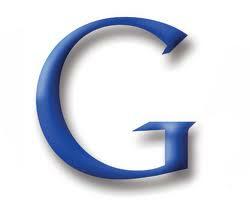 Once it has been processed and remove from the Google index your request no longer appears on the “Remove URLs” page. (use site: followed by the real URL/Link you removed). You should find no result returned or a “Your search – did not match any documents”. Babanature recently posted..Google Adsense Won’t Approve Your Blog? Try This Steps! Thanks for stopping by. This can come in handy in a number of situations. If you happen to delete or remove a post it is usually a good idea to do this soon after because it is fairly easy to forget later. I am pretty sure I have a few more posts floating around in Google that don’t exist anymore that I forgot to remove, and now I can’t remember exactly what they were – LOL. Excellent Post. Just paste the URL of the link in the website. To see the results, scroll down to right below the yellow bar. As long as this shows as status 200, Google’s Removal Tool will not be able to remove it. However, “if” there was a cache available, which there is not according to the screenshot you sent, we could do a cache removal. I am not sure that I understand what you are saying or getting at. You can still remove pages that return a 200 status code if you add noindex to the page/post header or block it with a robots.txt file. Once you do either you can then remove it from Google with the removal tool. The page will still exist, but it will be removed from Google. It is a handy little tool, and I am actually surprise that they get removed that fast. I know people talk sometimes about Google taking too long to index a post, but the sure do know how to remove one fast! Nothing wrong with a little clean up every now and then. I know how to do all of this Ray but I have a question for you that I’m sure you can answer. I was told by an online friend that the reason I continue to get slapped by Google is because my tags are duplicates. Not sure what he meant or how that happened but he kept telling me he’s “show me”. He never did, go figure. Anyway he said that I could delete them in webmaster tools. So I did this same process with each link. The odd thing is that it only took one and told me the rest had failed. Is there another way to remove these from Google searching them since they’re duplicates? Appreciate your response and hope you don’t mind me asking this one here. Did he give you an example of what he meant by duplicate tags? People tend to use the word tag when referring to more things than we did a few years back. 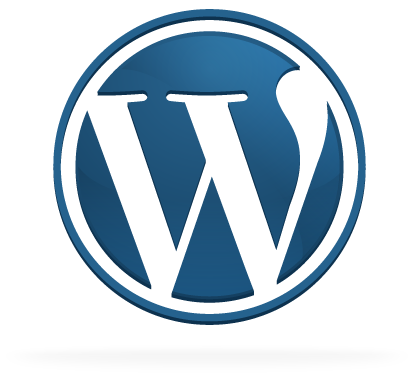 With WordPress of course we can tag posts. Coders and programers will sometimes mention tags like html tags instead of brackets now. 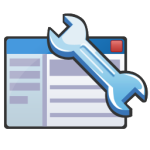 If you did remove something in webmaster tools and it failed it’s possible the whatever you were trying to remove wasn’t properly blocked by either page code or robots.txt file. I personally prefer the robots.txt route. I am going to email you shortly with one potential issue I noticed on your website that could be causing some issues. I didn’t spend too much time on it, but I will pass that along to you in an email shortly. Thnx man I recently deleted some post on my blog but it’s not deleted from google but your tutorial really helped me.. thnx. Thanks for the Post, I have used Webmaster URL removal tool 2 weeks before but still my site old links are in google search index and cache but removed 🙁 should i need to wait more than 2 weeks ? It shouldn’t take 2 weeks. I just removed a couple more myself yesterday and they were processed and removed in less than 24 hours. Then, on the far right side of the page there will be a little button looking thing that says pending. Click that and a drop down will allow you to check “Removed”, “Denied”, “All”, etc. Inspect these to see if there was a problem with your removal request. Maybe the page you removed isn’t returning a 404, you didn’t add noindex to the header, or you didn’t properly block it with robots.txt.